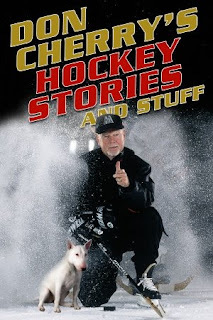 With the release of Don Cherry's new book Don Cherry's Hockey Stories and Stuff , the question I know people will be asking is "Which is better? Don Cherry's 1st or 2nd book?" 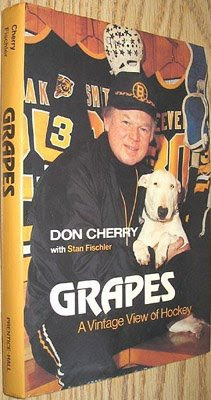 You see, back in the early 1980s Cherry and Stan Fischler teamed up to bring us Grapes: A vintage view of hockey . It was republished in mass market paperback form in 1999. Like Cherry himself, the book has had a cult following and has had a much longer shelf life than most books. I do not know the hard data, but it is fairly safe guess that this book would be classified as a huge success. That book was very similar to his new release, although it at least had proper structure and, aside from Cherry's direct quotes, proper English. He told lots of great stories about his minor league days and his days behind the bench of the Boston Bruins. In his new book Cherry understandably spends more time telling stories about his days on television. He certainly touches on the good ol' days, and he goes off on tangents outside of hockey. Don Cherry's Stories And Stuff is very much Coach's Corner comes to paper. Lack of structure aside, the main difference is the two distinctly different Don Cherrys in the two books. Albeit, they are different only to the reader. Cherry is exactly the same guy. Grapes will always be Grapes. But Don Cherry fans across different generations see him differently. The original Grapes book was told by a man who was just becoming popular on television, but was still best known as a career minor leaguer and Bobby Orr's NHL head coach. In Cherry's second book he is the Coach's Corner legend, as much caricature as just himself. That's all he is known as for a couple of generations of hockey fans. If I had to rank one over the other, I would have to pick the original. Both are entertaining, but Grapes was far better structured and, though maybe it's just me, it has a higher degree of sincerity to it. Either book provides an interesting taste of Cherry's natural personality, if only in hints in Stories and Stuff. He has become so synonymous with his Coach's Corner television character that it is nice change of pace with Cherry.